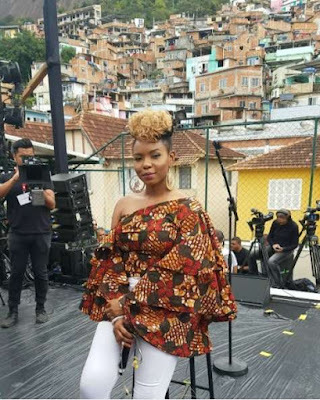 Surrounded by cameras and favelas (urban slums in Brazil), Yemi Alade took to Instagram to share this image of herself posing in an area the legendary Michael Jackson shot his ‘They don’t care about us’ video. “Michael Jackson shot one of his most controversial music videos here. It is definitely a sight for sore eyes! I am proud to be on this great journey to sustainable CLEAN energy. We flew all the way to Rio to meet the entrepreneurs and experience their innovations firsthand! Physics and furthermaths formulas are not a waste after all #Favela #RIO #brazil”. Alade is currently in Brazil to shoot a music video for Shell’s 'Make The Future' global campaign.